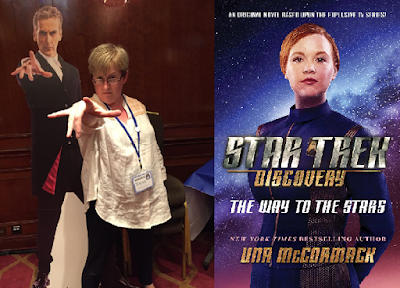 Exclusive Interview with author Una McCormack! Sylvia Tilly has turned into a breakout character on the newest Trek series, Star Trek: Discovery. Sometimes awkward, sometimes silly, but always brilliant, Tilly brought a lot of humanity to Discovery's first season. But what was she like before becoming a Starfleet cadet, and what choices led her to joining Starfleet? In this episode of Literary Treks, hosts Bruce Gibson and Dan Gunther welcome author Una McCormack back to the show to discuss her latest novel, Discovery: The Way to the Stars. We talk about the process of writing this novel, Tilly's relationship with her mother, her experiences in school, Tilly as a runaway, her impressions of Starfleet, the poor communication she experiences, and wrap up the discussion with where you can find Una online and what she is working on now. In the news section, we talk about the upcoming Discovery novel The Enterprise War by John Jackson Miller, and judge the covers of two upcoming Original Series novels: The Captain's Oath by Christopher L. Bennett and The Antares Maelstrom by Greg Cox. We also talk about an upcoming comic series from IDW: TOS: Year Five, review issue #4 of Star Trek vs. Transformers, and take a look at some Babel Conference feedback on Literary Treks 255: The Hammock Planet: They Don't Have Butts. 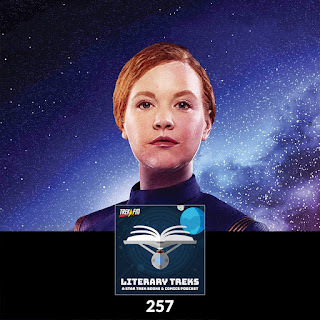 Next episode: Literary Treks 258: Inaccurate Operas Will Be Performed of This Day!